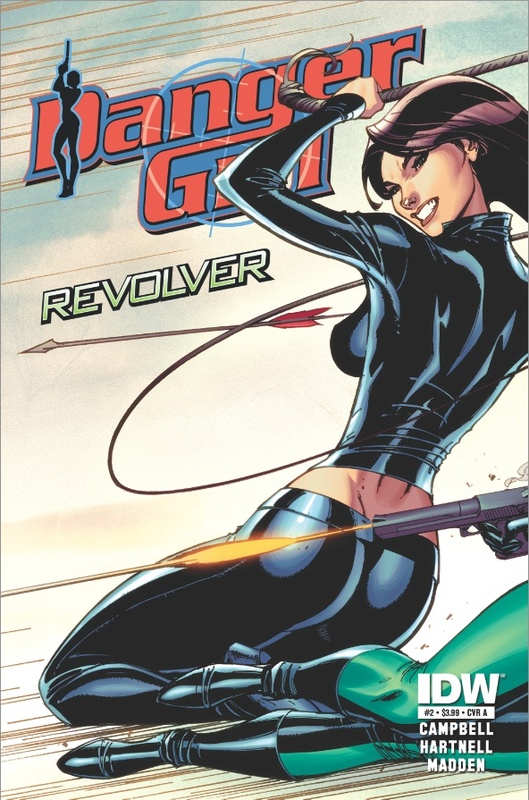 The Fellowship was fortunate enough to obtain a copy of DANGER GIRL: REVOLVER #2 from IDW Publishing. Andy Hartnell (co-creator of DANGER GIRL with J. Scott Campbell) writes the story with art by Chris Madden. Abbey and Sydney are in Peru trying to find Abbey’s ex-fiancé Nathan. They encounter a native farm girl who stole supplies, but gave them diamonds as payment. Our heroines follow the girl back to her village, which is suffering from a form of “punishment” – they can’t grow food due to lack of sunshine. They are led to a secret chamber where the Hochi Suburst, a golden medallion made as a tribute to their sun goddess, once rested. The chamber guardians believe that the sun goddess is punishing them since the Sunburst is missing. Back at their meeting place, Nathan crashes in on the girls…literally. He's closely followed by a female. Why does Sydney know her…? I enjoyed Madden’s art from JACK CHANCE IS THE COURIER and is a natural fit for this book. He handles over the top action and adventure and makes it fun. While the story is campy and a little cliché, it's a fun read and a nice change of pace from all the dark and serious books that are out there. I have not read the original DANGER GIRL stories, but if they are similar in tone, I may have to check them out. DANGER GIRL: REVOLVER #2 is out in stores now or available at www.idwpublishing.com.